2018 was not my best year as a Blogger, and not as a Traveler (if I can call myself as such) either. I had fewer blog posts and lesser collaborations. The latter was actually my choice as I have decided to focus on the brands I admire and would share even without a collaboration deal. Ed and I also didn't get to travel as much as we have done in previous years because of work situation. It's a long story but to make it short, I had to involuntarily leave the workplace that brought so many good things in my career as a Lab Tech. But then, that gave me the opportunity to begin a new chapter in a company I truly adore. That was my silver lining, I must say! 2018 was a year of personal growth, of career, and of family... a year of embracing life as it is. I was pretty quiet on the blog and on social media, so you can imagine my surprise when the team behind Illustrado Magazine contacted me for their annual 100 Most Influential Filipinos in the Gulf issue. 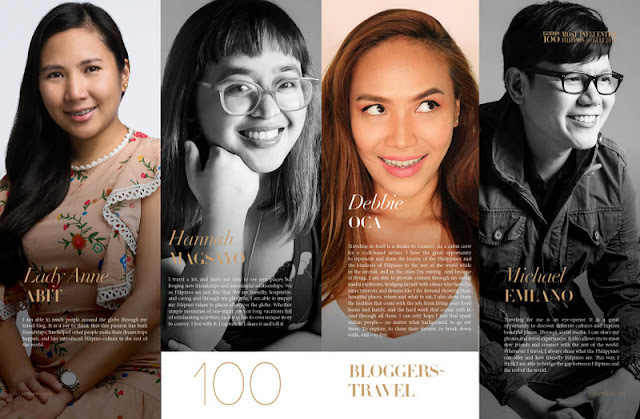 Humbled and extremely grateful, I thought I must have been doing something good throughout my blogging years to deserve this recognition for the second time around. Illustrado Magazine's 100 MIFG for 2018 was revealed yesterday on Facebook. Watching the live reveal sent shivers down my spine. 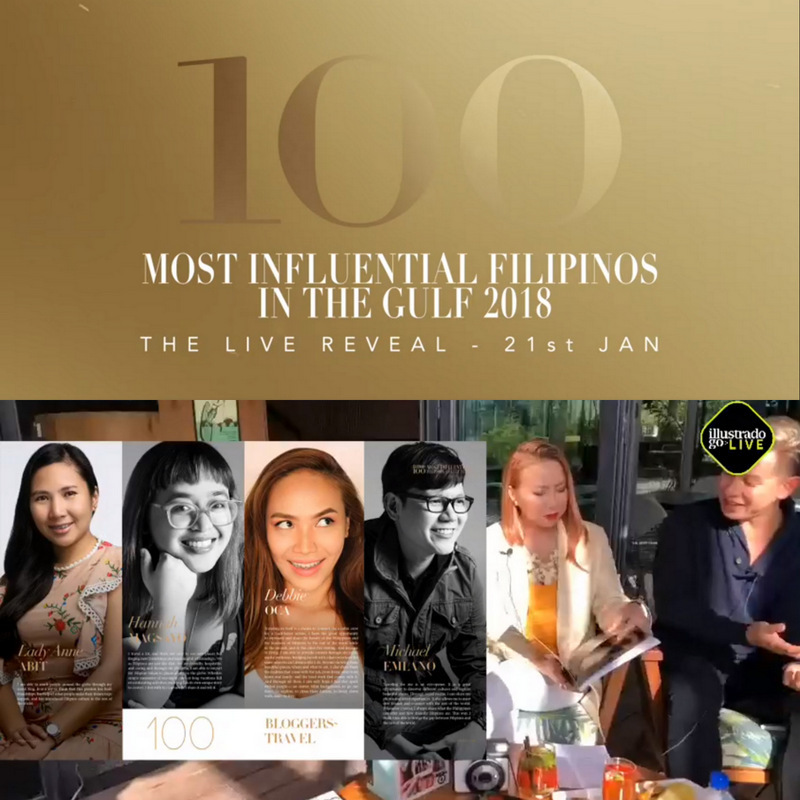 The list includes inspiring Filipinos that have brought so much pride and joy to the Filipino community in the Gulf. All those big names and then, there was me! Gosh! I could never get used to this nakakatuwa-nakakahiya-nakakakilig feeling! It is difficult to put into words, but it is an intense emotion that pushes me to do better in my craft and makes me think what else can my platform do for the community. I was listed as one of the Tastemakers in the Travel Bloggers category. I am so happy to be sharing the spread with seasoned travelers Hannah Magsayo and Michael Emlano, and Debbie Oca - a full-time explorer who happens to be from my home province, Negros Occidental. Illustrado asked us, "How do you bridge the gap between the Filipino community and the rest of the world through your own platforms?" I am able to reach people around the globe through my travel blog. It is a joy to think that this passion has built friendships, has helped other people made their dream trips happen, and has introduced the Filipino culture to the rest of the world. My love for traveling has opened my eyes to different traditions and values, to wonderful places and lovely people. By sharing my personal experiences on the blog, I hope I am able to inspire other Filipinos to go out and see how beautiful our world is. Moreover, I love creating content that highlights the beauty of the Philippines and its people. It is my own way of saying to world how proud I am to be Filipino and how gem of a country the Philippines is! If you'd love to fuel your wanderlust, do follow @hannahmagsayo, @debbieohh, and @ikeng on Instagram! 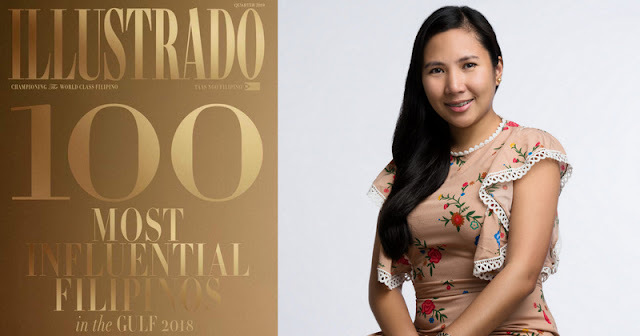 Thank you to Illustrado Magazine for making me a part of the 100 Most Influential Filipinos in the Gulf 2018. With this, I give credits to the most influential people in my life. Thank you for continuously inspiring me to do what I love, for reigniting that passion in times I feel like I'm losing it, and for always influencing me to become a better me! And of course, I owe this to you my dearest reader! Thank you so much for the love and support. You are with me in this milestone!